The religion of the Ancient Egyptians was extremely important to them and touched every aspect of their life. The religion of Ancient Egypt was a polytheistic religion (with many gods). 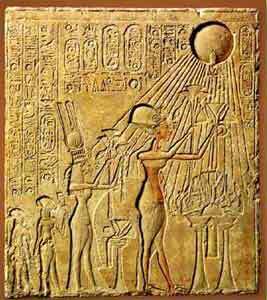 There was just one short period of monotheism (the worship of one god), during the reign of Akhenaten - who became known as the Heretic Pharaoh. The Egyptian Gods numbered nearly 2000. The main Egyptian Gods and Goddesses were fundamental to the Ancient Egyptian religion and fundamental to their beliefs. The main gods were worshipped throughout the whole of Egypt but many minor gods had just a local following. There were massive temples built to the gods but small shrines were also found in the homes of the Ancient Egyptians. In difficult times Egyptian Gods were offered various gifts, which were accepted by the priests and priestesses who offered prayers on behalf of the donor. The Priests evolved a Family tree of the main Egyptian Gods and Goddesses to explain how some of the Gods and Goddesses were related.